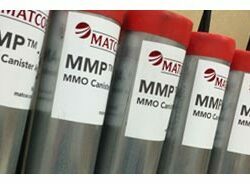 Canister Anodes | Matcor, Inc.
Canister anodes are commonly used for impressed current anode cathodic protection applications. These can be used to protect buried metallic piping in congested plant environments, to protect distribution or transmission pipelines in either distributed shallow ground beds or as horizontal remote ground bed anodes, and to protect other structures such as above ground or buried tanks and piling systems. MATCOR’s MMP™ Anode provides an outstanding combination of value, quality and proven reliability for use with these types of applications and are often a direct upgrade over other canister anode offerings. Below is a comparison of MATCOR’s MMO canister anode vs. conventional high silicon cast iron anodes, in addition to a real life project example comparing the costs associated with both canister anode types. 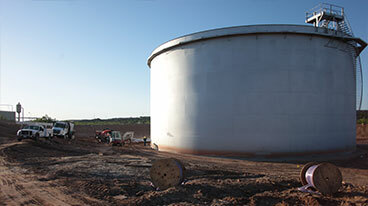 Most canister anodes consist of either a High Silicon Cast Iron (HSCI) anode or some configuration of MMO/Ti anode installed in a large metallic “canister” that is filled with coke backfill. The canister is capped with the anode cable extending out the top of the anode cap. Once installed, the exterior metallic canister housing is part of the anode system and will consume quickly as current is discharged off the anode, through the coke backfill and then off the external metallic housing. It is important to note that the housing is only intended to survive transportation and installation. Once installed, it is expected to be consumed, leaving behind the anode and coke backfill. One of the most important considerations in evaluating any canister anode technology is to evaluate the anode technology that is inside the canister anode. Unfortunately, it is very difficult to assess the quality of a particular anode casting batch without extensive long term testing. Even the most experienced and reputable cast iron anode suppliers will admit that HSCI anode quality and anode performance can vary significantly even within different casing batches from the same manufacturer. This leaves buyers with a real challenge in confirming that the anodes they are purchasing will provide the anode life and current output that they are specifying because of the wide range of casting quality issues that can occur with HSCI anodes and the large number of casting facilities offering this type of product. Mixed metal oxide coated titanium (MMO/Ti) anodes are also a common anode technology utilized in canister anodes – typically these anodes consist of a titanium substrate on to which a mixture of mixed metal oxides is electro-deposited on to the substrate and thermally cured. The MMO coating typically uses a base of Iridium as the primary catalyst that allows the coating to perform as an anode. As with HSCI anodes, quality is an issue with MMO/Ti anodes; however, there are some key factors that lead to making MMO/TI anodes easier to QA/QC than conventional cast iron anodes. First, there are no real mechanical concerns other than assuring that there is good adherence between the MMO coating and the underlying substrate. Because the substrate is pure titanium the mechanical properties are quite consistent (ASTM Grade 1 or Grade 2 Titanium is considered commercial pure titanium and either can be used for MMO/TI anodes). Testing for coating adhesion is a rather simple test that can be performed on a test coupon from the same process or on the anode itself. In addition to having a very stable, homogeneous substrate, the MMO/Ti anode performance can be tested using accelerated life testing to provide an evaluation of the performance of the specific coating mixture that is applied. As with HSCI anodes, there are a large (and growing) number of suppliers of MMO/Ti anode materials; however, testing can be used to confirm the anode material quality. 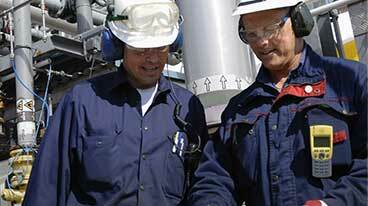 MATCOR MMP™anodes use MMO/Ti anode material with a proven track record. Additionally, third party inspection and testing of MATCOR’s MMO/Ti anode material is available for a nominal inspection charge. The actual anode inside the canister can have a wide range of configurations; however, the most common configuration is the tubular anode. All HSCI anodes are cast in tubular (either solid or hollow tubular) configurations and many of the MMO/Ti canister anodes also use tubular anodes. For HSCI tubular anodes, the brittle nature of the anode must be taken into consideration when transporting, handling and installing the anode as dropping the anode canister can lead to breaking or cracking of the HSCI anode. MATCOR’s MMP™ Anode is unique in that we utilize a solid titanium rod as our substrate. This provides several advantages over typical MMO/Ti configurations utilizing tubular anodes. The cable to anode connection is easier and more secure when connecting to a solid rod as opposed to trying to connect a cable to the inside of an anode tube. The solid titanium rod is also stronger and unlikely to break should it be bent. Other MMO/Ti configurations can also be used inside a canister anode including MMO/Ti strips and ribbons. There is nothing inherently wrong with these configurations as long as the anode to cable connection is properly designed. Improper anode to cable connection designs can lead to premature anode failure. Typical anode connections used for discreet canister anodes usually consist of some version of a pressure fit mechanical connection with an epoxy sealant covering the anode to cable connection. Anode to cable connection failures have historically been a significant cause of premature anode failure. Depending on the anode type and configuration, the location of the anode connection can also have an impact on performance – especially for HSCI anodes that consume rapidly and may be subject to necking effects– with MMO/Ti anodes that are dimensionally stable (i.e. do not physically consume) this is much less of an issue. MATCOR’s MMP™ anode utilizes a multi-step welded connection technology to assure the anode to cable connection is mechanically and electrically secure and properly sealed from the ingress of moisture that can lead to premature anode failure. The multi-step anode connection includes a mechanical crimp followed by a welding process. The mechanically secure welded connection then has a layer of non-conductive hot melt sealant followed by a heat shrink sleeve with a second sealant layer on the interior of the heat shrink. This heavily engineered connection technology has proven to be exceptionally effective with hundreds of thousands of connections in service over the past 20 years. Most canister anodes are constructed using a thin walled galvanized steel spiral wound pipe material. 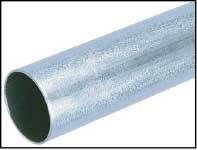 This material is commonly used in the HVAC world as a ducting material and is readily available commercially. This material is typically 0.7mm thickness (24 gauge) with a spiral wound construction. This type of canister provides only a modest amount of mechanical strength and must be very carefully handled during transportation and installation. MATCOR’s MMP™ Canister anode utilizes a thicker walled EMT seamless steel pipe with a typical material thickness of 1.8 mm or 250% times the thickness of typical canister anodes. This additional wall thickness makes the MMP™ anode a much stronger product – you can drive a fork truck or backhoe over our anode and not significantly damage the canister. The actual installed cost of the anodes is an important consideration in selecting the optimal anode solution. As noted previously, the anode system quality and design integrity should also be factored into the evaluation as these factors can serve to reduce the anode system’s life in the field. Every anode has an operating life. For HSCI anodes the calculation of an anode life is complicated by the inherent variability in HSCI anode casting. The nominal consumption rate of HSCI anodes is typically assumed to be between 0.5 to 1.0 lbs/amp-year (0.23 kg/amp-year to 0.45 kg/amp-year) in a coke backfill. This wide range is consistent with the variation in anode consistency and quality inherent in the anode type. The consumption rate can also vary depending on the environment and the operating current density. Additionally, a utilization factor is typically applied to the calculations as the anode can never be fully utilized – at some point the anode consumption is such that the anode to cable connection is lost prior to fully consuming all of the anode’s mass. For stick anodes with an end connection this is typically 65% (meaning that 35% of the anode mass is unusable) while for tubular anodes with center connections this utilization factor is closer to 85%. MMO/Ti anodes are considered dimensionally stable anodes and do not physically consume. They are instead electro-catalytic in nature – they cause a reaction to occur that generates DC current flow without actually being a reactant and thus are not consumed. The catalytic component in the MMO coating does; however, have a finite life that is relatively consistent and can be determined based on the accelerated testing performed by the manufacturer. The challenge with MMO/Ti anodes is that the coating loading is on the order of mg/m2. With such a light coating load, it is often difficult for the anode manufacturer to control the coating loading to exactly the thickness that would be optimal. Most MMO/Ti anodes are supplied with more coating than required to assure that the coating thickness QA/QC spot checks exceed the minimum specified coating loading. MATCOR’s experience has been that the anode coatings tend to exceed that required coating loading by a significant margin assuring even longer life than the stated design life. One of the key advantages of the MATCOR MMP™ anode is the low weight over HSCI anodes for a similar current capacity. HSCI anodes consume at a relatively high rate and require significant anode mass to provide the current output and life required. 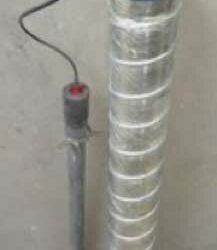 Weight has two key impacts; one is economic as the lower the anode weight the cheaper it is to transport and install, and the second is a safety issue as the heavier the anode the greater the risk of injury associated with the proper transportation and handling of the anode during installation. While the transportation costs are easily quantified, the safety benefit of a much lighter anode to be installed is much more difficult to quantify but should be considered in the anode selection. Another consideration that should be given is the cost of having to replace an anode installation more frequently. This metric is often not considered; however, there is a very real value to having an installation that lasts 25 years versus only 18 years and the additional incremental cost for the additional life has a real value that should be considered in the economic evaluation. Another consideration that is often overlooked is the savings that might be achieved by using fewer anodes that are capable of higher output to reduce the overall installation costs. The incremental cost of fewer, larger anodes could result in a significant cost savings over using more anodes that are rated for lower output. When considering the use of fewer, higher output anodes the impact on system resistance could be an issue as the power supply may have to be larger and the operating power higher to overcome the additional system resistance from fewer anodes. Typically power costs are rather nominal and not a major consideration in this type of economic evaluation. Please note that this is a real project example and is intended to show the methodology used to evaluate two different options – one using HSCI anodes and the other using MMP™ canister anodes. The costs associated with this project are not suitable for other applications – each project has its own costs that must be evaluated for that specific project. Shallow horizontal ground bed rated for 60 Amps using multiple anodes in parallel at a depth of 12 feet and spaced 15 feet from each other. Each hole would be 8” diameter and the hole would be filled with coke around the anode including one foot below the anode and one foot above the anode. System to be suitable for 30 years anode life. Soil resistivity is assumed to be 3000 ohm-cm. Anode Dimensions 3" x 60" 3" x 60"
Contact MATCOR about your canister anode cathodic protection requirements or learn more about our MMP Anode (MMO) canister anodes.